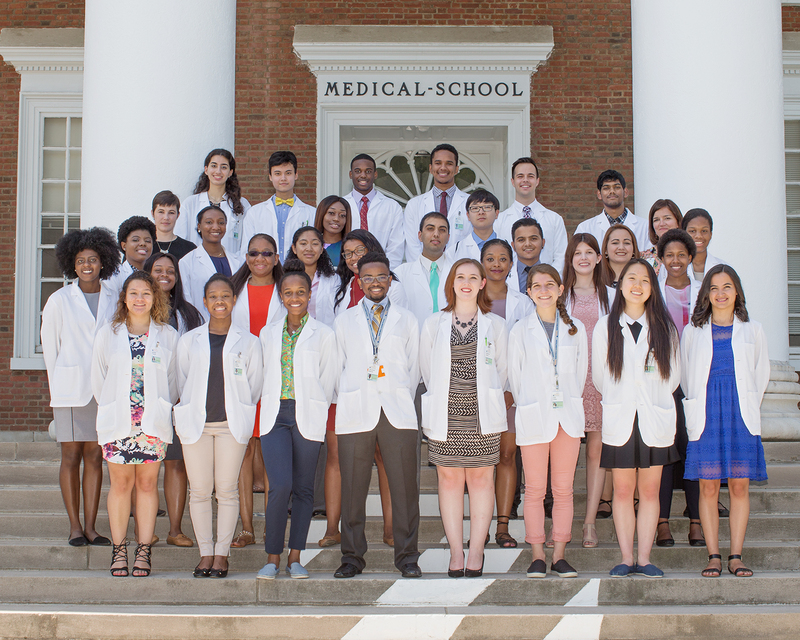 The University of Virginia School of Medicine (UVASOM) is conducting a new innovative medical academic enrichment program, the Summer Medical Leadership Program (SMLP). The number one goal of SMLP is to expose the participants to the “real world of medicine” to prepare them not only for admission to medical school but to assume future leadership positions in medicine/biomedical field. SMLP builds on the success of the previous UVASOM medical academic enrichment programs; Medical Academic Advancement Program (MAAP) and Summer Medical and Dental Education Program (SMDEP). SMLP is an intensive six-week residential summer medical academic enrichment program for 30 undergraduate students from underrepresented groups and disadvantaged backgrounds who are interested in pursuing careers in medicine, and chosen from a nationwide pool of applicants. Since 1984, the University of Virginia School of Medicine (UVASOM) has had a proven solid record of operating outstanding medical academic enrichment program for students from underrepresented groups and disadvantaged backgrounds (i.e. racial and ethnic groups that have been historically underrepresented in medicine or from parts of the country such as rural areas where residents have been historically underrepresented in medicine or economically disadvantaged background). The increased representation of these individuals in medicine is of paramount importance to the UVASOM and is in consonance with its mission to improve the health of the people of Virginia in particular and the nation as a whole through education, health care, and research. Below is information related to the success of the UVASOM medical academic enrichment programs for individuals from underrepresented groups and disadvantaged backgrounds: Data from our participant tracking system indicate that since 1984, over 600 past participants have already obtained their M.D. degrees; 29 of the program alumni are medical school faculty members including a former chairman of Ophthalmology (Dr. Keith Warren). Two of the program alumni are UVASOM faculty members (Dr. Michael Williams and Dr. Leigh-Ann J. Webb), and another is on the UVA School of Nursing faculty, (Dr. Randy Jones). SMLP is under the direction of Dr. Taison Bell. Dr. Bell is the Assistant Professor of Medicine in the divisions of Infectious Disease and Pulmonary/Critical Care Medicine as well as the Assistant Director of the Medical ICU. Dr. Bell is highly invested in teaching and is the director of a multidisciplinary mechanical ventilation course taught to critical care fellows at UVA. He is consistently rated as one of the top teaching attendings in the department of medicine. In addition, his interests are in improving inpatient health care delivery through quality improvement initiatives and increasing workforce diversity. A lecture series on leadership by distinguished faculty. Provide mentoring by eminent physicians and biomedical researchers. Expose students to the “real world of medicine” through a clinical medicine lecture series on cutting edge topics in health including: health disparities and global health, telemedicine, bioethics and bioterrorism. Expose students to the role of physicians in promoting good health, the fact and fiction surrounding addiction, sexually transmitted diseases including HIV and AIDS, cancer-current status and future prospects, as well as challenges and rewards of a career in medicine and biomedical research. Expose students to an introduction to obstetrics and gynecology, pediatrics, geriatrics, dermatology, emergency medicine, radiology, radiation oncology, endocrinology and cardiovascular diseases. Provide extensive opportunities for interaction with physicians via a series entitled “Where Doctor’s Work”. In this series, students visit clinical settings such as the autopsy department, radiology department, cardiology clinic, an assisted living facility, the primary care clinic, internal medicine primary care clinic, an innovative program of all inclusive care for the elderly (PACE), and a state-of-the art Simulation Center. Provide personal counseling session where students are assisted in developing a career development program directed toward exploration of the medical professions as well the development of an individualized education plan that includes identification of other appropriate future development experiences. Provide do’s and don’ts of the medical school admissions process, including simulated medical school interviews. Provide workshops focusing on opportunity for financial planning, time and stress management. Participation opportunity in a medical school recruitment fair during which representatives from several other medical schools meet with the participants to describe their schools’ admission criteria, programs, support services and offer other information about their schools.